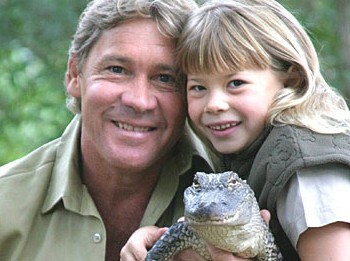 It has been a year since our much loved Crocodile Hunter, Steve Irwin, died. I encourage Steve Irwin fans and mourners to continue using the website and promoting it's cause; to remember Steve Irwin, his work, and dedication. The Steve Irwin Memorial will be 1 year old on the 5th of September, 2007 and will continue to be an actively used and updated Steve Irwin Memorial and Fansite. Just a heads up that there are new shows coming on air that are made by Bindi Irwin. 'My Daddy the Crocodile Hunter' will air at 8pm on Animal Planet in the States. 'Bindi the Jungle Girl' will play on Discovery Kids on Saturday at 5pm and again on Sunday at 8pm. There are new pictures in the gallery of Steve and his children. Check them out and feel free to leave comments. Steve looks down at a Lizard with a sense of passion in his eyes. Steve showing some skin and holding a sm..
Terri Irwin smiles while holding a Koala.. If you wish to submit a picture then please post it in our Forum. She has her dads eyes you morons that think,she has mosaics. Look at here now she still,has stves eyes and personality. Bobby has more of terrys,freatures but can still,see a bit of steve in,him,too. Thanks Steve, for inspiring lots of people and making the world a better place. Lots of people think about you! If you were still alive, you would be a great influence to young children and you would probably be rich. Bindi you are also a great inf..
Steve and his daughter Bindi. Actually, she is beautiful. And having a beautiful son with mosaic down syndrome, myself, I wondered if she has mosaicism. She sure is a smart and talented actress. bindi ur gonna grow up just like ur dad and so is ur little brother bob, bindi u r a good person dont let anyone tell u u r not keep up the good work u guys R.I.P. to the hero of many Steve Irwin. I really wonder how good looking is the person who said Bindi is UGLY. I was deeply saddend when I heard of Steve\'s untimly death, the work he did, and the education he brought to this world about our wildlife, and environment, has been essential information, in saving our endangered species, and destroyed environment! Thanks man we love you and miss you always! My comment is to the childish people posting saying Bindi is ugly , and has downsyndrom, why dont you grow up, is that all you can do in your life is belittle and make fun of people, You disgust me and give a bad name to the human race!! Get a life! Poor kid, she\'s so ugly. Does she have Down\'s syndrome? That\'s some puffy and slanted eyes she\'s got! Bindi for a girl your age you are very brave. I'm so proud of you making that tribute to your dad. I hope all is going well. Always when I look at this photo I think of how close you & your dad were. I send my prayers & condolences. This is a great photo of Bindi and Steve, they both look so happy and i hope Bindi keeps the family name going. iam so sorry of the lost of your daddy i hope you and your brother contuine the love and passtion of animals like your dad did. hell always and forever be with you in your heart and soul hes your angle looking over you all. god bless and good health. I'm so sorry for what hapenned to our Steve..he was really cute. Bindi,I hope you'll continue what your father had started.Wish you the best! i am really sorry about steves accident he had right well when i go to my school i will sell like t-shirts with steves picture so that way steve could die in peas so if you could just send toys shirts stuff with steves face to this adress 14484 lanark street 91402 so just bring it i promise we will earn money for steve to rest in pease and like more stuff for you guys to buy to put in austrailia zoo so i hope steve and australia people happy so goodbye write to me i pray for steve by steves family terri,bindi,robert and australia friends hope you come if we earn money we will send it bye bye. Looking at pictures I see such a loving bond. As the years go on these pictures will be a great memory for Bindi and give Robert some idea what a good and loving husband, father, son and friend to his family. This is a precious picture. One that Bindi will probibly always treasure. Stay strong little girl. Your father will look over you and protect you always. THEY LOOK SO ADORABLE TOGETHER I KNOW THAT HE WAS A GREAT DAD.... HE HAD A GREAT FAMILY! STEVE HAD A GREAT FAMILY HE WAS DAD! Bindi and Steve look a lot alike. I'm sure she's going to follow in the footprints of her dad. The legacy of the Crocodile Hunter will live on. I want to live in australia whenever i grow up and work at the australia zoo with bindi. thE LOVE FOR ANIMALS LIVES ON!!!!!!! I love this picture! Bindi, I hope you continue what your father started, you are such an amazing person. All pictures featured in this gallery are used under the Fair Use act or are released to the public domain.